An investigation into Roosevelt Boulevard construction documents shows a pattern of absenteeism, insufficient crew, lack of supplies, shoddy work and indifference to City inspectors’ remarks. It also raises serious questions about FDOT’s cozy relationship with the contractor. Key West The Newspaper received hundreds of pages of emails and reports from the City of Key West’s utility department. The documents relate to the $ 4.5 Million 24” sewer force main that is being replaced beneath the Boulevard at the City of Key West’s expense. First, the documents confirm what was suspected all along, that John and Lisa Chaney, the couple that was debarred from performing public works for Dade County after allegedly bribing a sewer inspector (who had let pass shipshod sewer work that later had to be dug back out and replaced), are the subcontractors in charge of the sewer main replacement project on Roosevelt Boulevard. Documents show that not only has John Chaney been physically working on the Boulevard project, but he has clearly been the man in charge of how things get done by J S & L Site, Inc., State Site Development, and D2 Construction, three of the four companies that have participated in the installation of the sewer force main. Neither AMEC, the engineering company employed by the FDOT, nor FDOT itself inspects Chaney’s work. The sewer work is inspected by Chaney and either accepted or rejected by City inspector Steven Gardner and his boss Jay Gewin. To assist when technical questions arise, the City has also hired local engineering company, Perez Engineering. We must hand it to inspector Steve Gardner. Rain or shine he’s onsite checking backfill quality, parts quality, slope of pipe, integrity of joints, etc and Gardner reports every detail in a small daily logbook. The problem is, apparently no one seems to listen or care. The most disturbing part, from the point of view of the people stuck in traffic or struggling to keep a business alive on that stretch of roadway, is the small number of people seen working; there are sometimes as few as three. The logs show the inspector complains of waiting for hours for the work crew to actually show up, or when they get to work there is incessant bickering about what should be done, or there are simply not enough workers to move on with the installation. 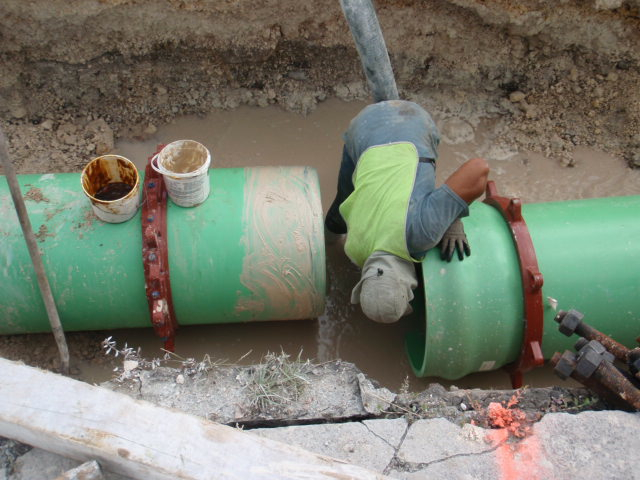 On June 29, 2012, Gardner notes, “No pipe work today. Short crew.” Then on August 10, 2012 Chaney shows up and fires all of the machinery operators. Gardner notes the work has to go on with an even shorter crew. The replacement operators don’t appear to perform much better: according to a letter to the Department of Environmental Protection dated August 31, 2012, one thousand gallons of sewage spilled onto the Boulevard the previous day after an operator struck a valve on a 2” pressurized sewer pipe. Around Christmas time everyone takes a 10-day vacation and on January 3, 2013, the day they are meant to return to work, the inspector complains that no one showed up until noon. Sometimes Gardner manages to get Chaney to redo some of the work. On August 20, 2012 a test showed that a section of pipe didn’t hold pressure. Apparently, Gardner had to go to the general contractor (de Moya) to convince Chaney there was a leak and to fix it. But in other cases it appears that Gardner’s complaints are completely ignored. On November 16, 2012 Gardner notes that a section of the force main pipe has an excessive deflection that is so pronounced he could see it plainly at a glance. He pointed it out, but Chaney had the area back-filled anyhow. The backfill, by the way, is another constant source of objection. Apparently the compaction of materials around the sewer pipe is extremely important. It has something to do with the fact that the pipe is beneath a high traffic highway and that trucks will be bouncing on top of it 24/7 for many years to come. Pipes can crack, sewage can leak into the freshwater supply or into the ocean. Leaks are very difficult to fix once the roadway is complete and according to David Romero, of AMEC, the contractor’s warranty is only good for one year. After that the City will be on its own for any repairs. As early as June 8, 2012, Gardner reports that the crew is backfilling with the wrong materials. In fact, they were using excavation material straight out of the ground, with workers sometimes observed kicking the larger bits of rock out of the way as they went along. Gardner notes that even though all inspectors on site agreed that the backfill was improper, the Chaneys refused to stop burying the new pipes. On at least one occasion the city inspector voices concerns over substandard work which could result in “future problems”. On September 12, 2012 he notes that Chaney’s crew is “piecemealing pipes together” for lack of fittings and he doesn’t “want a bunch of sleeves”. Perez, the City’s hired engineering firm pushes the issue all the way to the general contractor, but apparently not even the engineer can get them to change their ways and the pipe is backfilled anyhow. And then there are endless reports of lack of materials. The crew regularly runs out of this or that. On June 9 the inspector notes the crew ran out of pipe. When they begin working again a few days later they run out of some essential bronze fittings. Against all odds, they find one downtown at West Marine, probably between the flip flops and the Captain’s hats, but there was only one. So, they stock up again. On other occasions the inspector complains that they are using some apparently infamous Chinese manufactured “star” fittings. Sometimes the work just stops altogether. The inspector notes no work on the sewer main was done between February 24 and March 12. And when it finally resumes on March 12, the inspector notes that only 2 workers showed up. The list goes on. Another disturbing issue is the apparently very cozy relationship between AMEC (FDOT’s engineering firm) and the Contractor. Under the contract, you see, the contractor will pay a late fee totaling over $ 16,000 per day (up to a cap of $ 1.2 Million) for each day that goes past the contract deadline (originally 820 days from the start date). AMEC however can extend the contractual deadline due to adverse weather conditions. So far (as of April 30, 2013) 33 inclement weather days (‘rain days’) have been added to the contract deadline. As we reported last week, we took a look at some of those ‘rain days’ and found that NOAA reported mere trace amounts of rain. This issue became even more interesting when we cross-referenced the ‘rain days’ allotted by FDOT with the City inspector’s notes. On the form that the City’s inspector fills out each day, there is a special box that indicates, when checked off, that weather has negatively impacted the workday. Interestingly, where cross referencing documents were available, KWTN found that on most of those so-called ‘rain days’ the City inspector checked the weather box showing “no effect all day”. So, the question is what happened between the time the City inspector checked off on his official form “no effect all day” and when FDOT turned that very same day into a “rain day”. Keep in mind that every one of these little rainy day gifts has the potential value of over $16,000. Well, if you go back to the records available for those days, you’ll notice a frequent pattern: the suspect ‘rain day’ is often a day where something broke or the material didn’t show up on time or there are not enough workers. Those days seem to have miraculously turned into “rain days”. Regarding the determination as to the ‘rain day’ so graciously given to the contractor by AMEC that day, Gardner checked off “no effect all day”. The next day he notes it rained for 1 hour but that it did not effect the workday; however, FDOT’s engineer called it another “rain day”. A project initially estimated at $ 21 Million was driven by contractors’ strangely consistent bids up to $ 41 Million. It was going to last 2 and ¼ years but after a year is already six months behind schedule [FDOT official spokesperson, Dean Walters, recently announced that work on the business side of the project would not begin until October; the schedule posted on the FDOT website shows April 1st] and is ultimately being performed by 3 to 5 poorly trained workers replacing the sewer main and three or four more driving sheet piles. Oh, and the sewer subcontractor is on trial for bribery. No wonder they have been hiding behind a green fence. Officially the green fence was installed for the safety of passersby, but ironically the tarp caught in the wind two weeks ago in one section and caused the entire contraption (tarp, metal fence, and metal post) to come crashing down onto the Boulevard. One would think that while feigning concern over safety, the contractor would have at least anchored the fence properly (so as to avoid essentially creating a safety hazard). It has been reported to KWTN that at least one car was hit when the mishap occurred, allegedly causing around $ 6,000 in damages. By some strange twist of fate, the car belongs to Joan Alexander, former owner of Citgo, one of the companies that was forced to fold as a result of the lapse in business caused by the Boulevard reconstruction project. More Blue Paper coverage of Roosevelt Boulevard reconstruction here.